NEW YORK (CNNMoney) -- Even in these down times, there's money to be made buying and flipping houses. One might think this would be a most dangerous game -- after all, home prices are down more than a third from their peak in most areas. But plenty of investors are taking the risk in exchange for big profits. 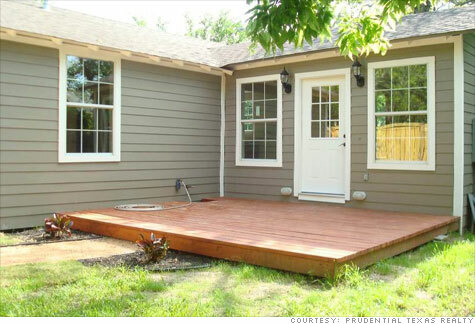 "It's absolutely viable," said Perry Henderson, a real estate agent and investor in Austin, Texas. "But you have to buy intelligently and go after the right opportunities." Of course, this is Texas where home prices have remained more stable. The buy-and-flip is more difficult to execute in Florida, where the bubble hit hard. "It's been almost a dead issue," said Jack McCabe, a real estate consultant in the Sunshine State. "A lot of the deals done over the past two years were at 50% discounts to 2006 prices and they'll still turn out to be unprofitable." Still, there are some Florida flippers making money, particularly those buying inner-city properties selling at deep discounts. Some of the homes sell for $30,000 or $40,000 when they once fetched $200,000. "There are opportunities if you're sharp and knowledgeable about the local areas," McCabe said. "Buying at those prices, there are profits to be made." The buy-and-flip is also easier in rising markets, but there are precious few around. But Washington, D.C., is on the list, being one of only two metro areas to record year-over-year price increases, according to the most recent Case-Shiller 20-city home price index. "Most of my clients go through four of five properties a month," said Justin Konz of Restoration Capital, which finances many D.C.-area purchases. He claimed his clients are making gross margins of 35% or higher. Most shoppers buy very selectively from three main sources: foreclosures auction sales; homes repossessed by banks (REOs); and short sales. Prices must be rock-bottom low and fix-up costs modest, only about 5% or 10% of purchase prices. Henderson prefers ugly, beat-up homes that have sat on the market or "old houses that somebody's grandma lived in for 40 years and didn't do anything to. Now, she's passed away and her family wants to sell quickly." Those, he said, are where the deal can be found because he's improving the bad properties in good neighborhoods. One real estate investor, Brian Fuller, hates the term "flip," even though he and his partners buy and sell more than 200 properties a year in and around San Diego. "It doesn't describe what we do," he said. "We buy the biggest eyesore on the block and turn it into the best looking house there. We're helping pull up values in the neighborhood."